I’m a designer and illustrator who’s based in Edinburgh, UK, who has a thing about beautiful colours, bold and whimsical illustrations and patterns. I like to cheer people up with my illustrations and I hope to bring joy and happiness to my viewers through my illustrations and designs. I like to use Adobe Illustrator and Photoshop to create illustrations but my illustrations always have a “hand-drawn” style. I find working digitally allows me to really express myself but my illustrations don’t necessarily look digital. I create all my textures myself using traditional mediums. My inspiration. I was originally born and raised in Taipei, Taiwan then I lived in Shanghai for a year in 2006 before moving to the UK mid 2007. So you can say my inspiration is a bit of “East meets West” but coming from a Far Eastern background but living in the West for over a decade really helps me to generate ideas. I love to travel and I see travelling as one of my greatest sources of inspiration. Before I turned my career around to be a professional illustrator I worked as a professional chef for many years and in a number of high-end restaurants but after my daughter arrived I wanted to spend a lot more time with my family. So I spent five years studying and just a couple years ago I graduated from Edinburgh College of Art (ECA) with a BA(Hons) in Illustration. If you really look through my website you’ll see a lot of my illustrations are food based. I have been really lucky to be able to combine my vast food knowledge with my illustrations. To date I’ve had two traditional cookbooks published; Home Made Taiwanese Cooking and Home Made Chinese Cooking, but in 2015 I published my first illustrated cookbook with the popular “They Draw and Cook” website. I’ve also illustrated for a Foodies Festival and I’ve been involved with food packaging design, most notable for Lee’s foods who’s products are in most supermarkets in the UK. But I don’t only specialise in food illustrations. I’ve worked with a few well known clients including Snapchat, Royal Botanic Gardens Edinburgh, Edinburgh Zoo and all kinds of other customers ranging from individuals to large agencies. When I’m not working I love gardening, watching horror movies and eating/cooking delicious food. My studio is basically a little cozy cubby hole in my kitchen and this is why I named my shop “The Illustrated Kitchen”. If you’d like to learn more about me, would like to enquire about a commission or you’d even like to collaborate, or even if you just want to say hi, then get in touch via the contact form on this website. What kind of media do you use? For most projects I hand draw everything initially then trace into Adobe Illustrator where I do all of my line work and colouring. Everything is then finished in Photoshop complete with textures. I find working digitally gives me the ultimate control and any changes can be made relatively easy and quick. What is your turnaround for work? As quick as possible but in total honesty it depends on my workloads and the complexity of the project. For example if you just want a single image that’s quite simple with a possible one or two changes then you will be looking at just a few days. However if you’re creating an animation that needs dozens or hundreds of elements to illustrate then this will naturally take a lot longer. You’re best asking this when contacting me. How do you supply the final images and in what format? For clients who are based outside of Edinburgh, unless I have any special requests, I provide everything via Dropbox. This includes .ai files, tiffs, jpegs, anything that is required. Dropbox is so efficient that it negates the need to provide images on a disc/usb etc. I can however post discs/flash drives etc with the final images if required (charged accordingly). Bold, colourful, fun and often with some humour. I like to work with strong images that will make the audience smile. That’s how I like my personal work to look but I’m quite adaptable. Are you willing to work in other styles? To an extent yes but please bear in mind when contacting me I do have my style which you will see throughout my website. I can’t copy other people’s work or styles and I don’t do conceptual work so if you want an illustration that looks like a Picasso or a Dali then it’s not going to happen. What do you charge for illustrations? I follow the pricing guidelines as listed by the AOI (Association of Illustrators). Price wise there are many factors including complexity of project, how it’s going to be used (locally, internationally etc). The more you can provide in your email or brief then the more accurate a price I can give you. Yes, definitely. I’m happy to provide prints and will in the very near future be setting up a shop on this website where you can buy certain prints. For low volume prints we used Epson fine art photo printers and papers and for high volume prints we use an external printer who provide truly excellent quality prints. Again for prices get in touch. Do you make any products? Yes and I’m continually expanding my range of products, all of which will soon be available through my shop. I can produce products ranging from phone cases to cushions to tote bags and even pottery. Who are your big influences? There are a lot of “illustrators” that I really like but a few that really standout are Steve Simpsons, Benji Davies, Meomi (Octonauts) and Marc Boutavant. What’s this Draw and Cook thing I keep seeing? 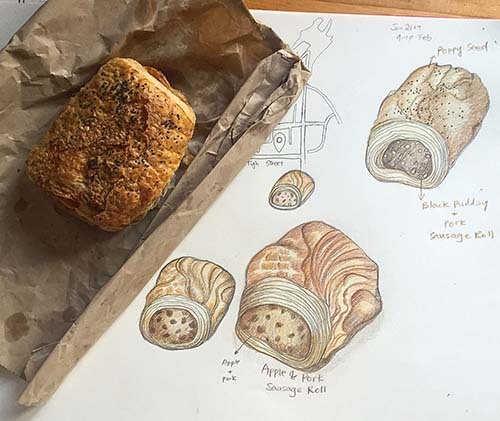 For many years I was a professional chef so it’s natural I will always be extremely keen on food and in the very early stages of my illustration career I discovered a website called “They Draw and Cook” where you can illustrate recipes and submit them. Right now they are hosting a big competition so I’ve set myself a challenge to illustrate 30 odd recipes and see if I can win this competition. It’s a lot of work but for myself a lot of fun! Snapchat, Royal Botanic Garden Edinburgh, UK Foodies Festival, Edinburgh Council, Highland Council, Lee’s Food, Edinburgh Zoo, The Devil’s Porridge Museum, Fettes College, The Andrew Carnegie Birthplace Museum, USA Pasokin Candy (Unica Foods), Flock Design & Advertising Agency, The Gate Worldwide Design and Marketing Agency, St. Columba’s Communities, Studioarc Design Consultants, Berlin Publisher, Marshall Cavendish Publisher, (China) Columbia Education Ltd.,.